Someone left an anonymous comment on my post about the brothers of Jesus, saying that my "reasoning seems rather closed minded and prejudiced." I would like to respond to his reasons for saying such a thing. Your reasoning seems rather closed minded and prejudiced. If you read additional scripture you will see that it says that Joseph did not know Mary until after Jesus was born. This infers that he did know her in the biblical way after Jesus was born. So Mary would not be a virgin her whole life as the Catholic church teaches. Gen 26:13 and the man became rich, and gained more and more until he became very wealthy. Deut 2:15 For indeed the hand of the LORD was against them, to destroy them from the camp, until they had perished. Deut 34:6 and he buried him in the valley in the land of Moab opposite Beth-pe'or; but no man knows the place of his burial to (or "until", heos) this day. 2 Sam 6:23 And Michal the daughter of Saul had no child to (or "until", heos) the day of her death. 1 Chron 6:32 They ministered with song before the tabernacle of the tent of meeting, until Solomon had built the house of the LORD in Jerusalem; and they performed their service in due order. 2 Chron 26:15 In Jerusalem he made engines, invented by skillful men, to be on the towers and the corners, to shoot arrows and great stones. And his fame spread far, for he was marvelously helped, till he was strong. Psa 57:1 To the choirmaster: according to Do Not Destroy. A Miktam of David, when he fled from Saul, in the cave. Be merdiful to me, O God, be merciful to me, for in thee my soul takes refuge; in the shadow of thy wings I will take refuge, till the storms of destruction pass by. Psa 110:1 A Psalm of David. The LORD says to my lord: "Sit at my right hand, till I make your enemies your footstool." Psa 123:2 Behold, as the eyes of servants look to the hand of their master, as the eyes of a maid to the hand of her mistress, so our eyes look to the LORD our God, till he have mercy upon us. Mt 28:20 teaching them to observe all that I have commanded you; and lo, I am with you always, to (or "until", heos) the close of the age." Mk 13:19 For in those days there will be such tribulation as has not been from the beginning of the creation which God created until now, and never will be. 1 Cor 1:8 who will sustain you to (or "until", heos) the end, guiltless in the day of our Lord Jesus Christ. As you can see, there are plenty of examples in Scripture of the word "until" not necessarily inferring a change in status of the clause that precedes it. 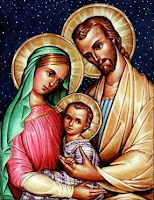 Thus, there is no requirement based on the word "until" to believe that Joseph knew Mary after Jesus was born. According to the society and culture in those times, they would have had many more children. Well, this family is obviously not your typical family. The Bible does not mention a lot of things directly, so not saying that Mary and Joseph looked for Jesus with his brothers means nothing. They most likely would have looked there first as most of us would have done. First of all, my conclusion does not rest solely on that argument, but instead on the cumulative effect of that argument along with the other arguments I made in defense of Mary's perpetual virginity. Also, you have to admit that no mention of the "brothers" of Jesus at the one time when you expect to read of them the most is surely an odd omission if these brothers really did exist. There is also a word that is usually used in Greek to mean cousins or distant relatives. The word that you propose means cousins or distant relatives does not make sense in the context is is used. Yes it does, just as it does in the context we use it today. In English too, we have words for "cousin" and other distant relations, but we use "brother" instead. I use this word quite often in fact to refer to guys that I am close to who are not my actual siblings. The New Testament audience was used to this way of speaking, so the writers utilized it, even though technically they had a word they could have used for "cousin." I am not a Bible scholar by any means, but it seems that you are trying to add your meaning to the Bible to fit your beliefs instead of making your beliefs fit the Bible which is the Word of God. The same could be said of you ;) All I've done so far is analyze the Biblical evidence. You should do the same. I don't have time to post very much today (or all week really) but I did want to at least make a short post in honor of last Sunday, "Divine Mercy Sunday." The Divine Mercy chaplet has had a great impact on my life, and I credit the slow, gradual progress I have made in my spiritual life to the faithful praying of this chaplet. The fact that I have been able to make positive steps at all is a testament to the power of God's mercy and of the trust in His mercy that is cultivated by this devotion. Please, learn more about the appearances and private revelations of Jesus Christ to Sister Faustina and consider faithfully praying the Divine Mercy chaplet. Hopefully, the entry in the Directory on Jesus' Divine Mercy can and will be your guide. 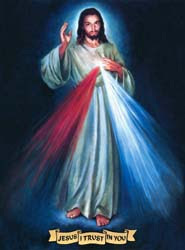 Also see my earlier blog post: What's the Divine Mercy Chaplet All About? Make sure you leave a comment on his blog and let him know what you think. 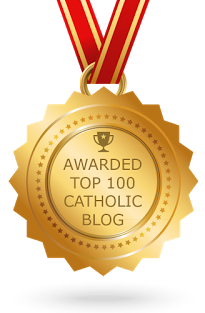 He appreciates the feedback and needs it in order to improve as a homilist.